Wood screws are screws that are used for connecting pieces of wood. Wood screws can be used for chipboard, MDF, softwood and hardwood. They are normally manufactured from strong materials such as steel or brass, which helps to strengthen joints. Wood screws feature a tapered body and a pointed tip which helps them to cut their own thread when being screwed into wood. Sometimes a small hole (known as a pilot hole) must be drilled into the wood first to help navigate the screw into the correct position. 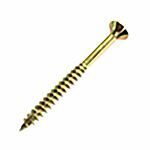 Wood screws are available with various different drive types and head shapes. The most popular are the Pozidriv and countersunk head. Fully threaded screws should be used where a strong joint is paramount. As the thread is the whole length of the screw, it can withstand greater forces and potential movement. Partially threaded screws do not feature a thread the whole way along the body, but have a smooth section underneath the head of the screw. Partially threaded screws are ideal for applications requiring two objects to be joined together tightly. Some partially threaded screws may have threads at the top and bottom of the screw and a smooth section in the middle. The thread above the smooth shank keeps the top material firmly in place.